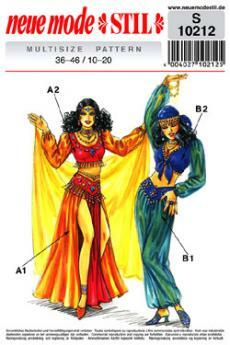 Although there are lots of places to buy a belly dance costume, sewing your own is simple and fun if you have a good pattern and a little bit of experience. There are several different designs for costumes, one of which will likely be perfect for your needs. You don't need to be an expert seamstress to complete this pattern; the instructions are very clear, even for beginners. 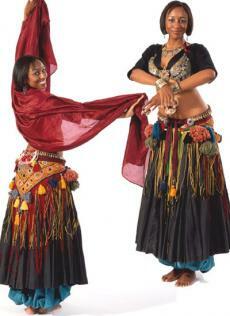 This exceptional belly dancing costume pattern comes in a range of sizes, both misses and plus size. You can use it to make costumes up to size 20. Simplicity recommends silks, satins, chiffons, and rayons for this costume. You can use cotton broadcloth as needed to give the pieces structure and help you work with them. You'll also need a variety of tassels and trims, depending on the pieces you intend to make. If you're a beginning seamstress, give some thought to the fabrics you choose. Slippery fabrics, like satin or chiffon, can be very difficult to work with, even for those with lots of experience. Consider a rayon or polyester with a matte finish for a little easier sewing experience. Most sources offer this pattern for about $15, but you may be able to find it for less if you wait for sales. You can buy the pattern directly from Simplicity or purchase it at a fabric store like JoAnn Fabrics. Since the directions are a bit older and are translated from German, this pattern is better suited to those with some sewing experience. Since this is a German pattern, as well as a vintage design, sizing can be a little complicated. The pattern states that it works for US sizes 10 through 20, but it's important to remember that sizes have changed dramatically over the years. What was once a size 10 is now a size 4 in many cases. You'll need to take complete measurements and compare those to the sizes on the package. The somewhat unclear guidelines on this pattern call for "carnival fabrics." This refers to the costume fabrics that you've probably seen in your local fabric store. Great choices would include bright satins, chiffons, and other flowing materials. However, if you're not an experienced seamstress, always look for fabrics that are matte instead of shiny. They will be easier for you to work with. It's not easy to find an original paper copy of this pattern, even on eBay. Instead, it's best to opt for a reprint or download of the design. SewingPatterns.com has this design in its inventory of vintage patterns. You can purchase a paper copy for $15 or download and print your own for only $8. This pattern requires many different sewing techniques, since it involves a variety of materials and unusual pieces. If you're an experienced seamstress, this shouldn't be a problem. If you're new to sewing, you might need help from an experienced friend from time to time. This pattern is sized in small, medium, and large. Plus sizes go up to 2XL. Since this is an authentic design, you'll be using some different materials. In addition to the silk and satin you would usually use, you will need a tapestry piece or other sturdy decorative fabric for the belt, as well as a number of fringes, tassels, coins, and other embellishments. It's easy to find Folkwear patterns right on the Folkwear site. You can also purchase this design from Amazon.com. You'll pay $20 for the pattern itself and about $5 for shipping. This pattern is good for beginners, although it's important to follow the directions especially carefully when constructing the bra. This pattern fits a wide range of sizes. You can make this costume in anything from a misses' size 6 to a size 22. You can use a number of different fabrics for this pattern. Simplicity recommends silk, satin, brocade, taffeta, velvet, chiffon, and lame. Remember to choose fabrics with a matte finish if you're new to sewing. You can buy this pattern directly from Simplicity, or you can purchase it from Walmart or your local fabric store. The suggested price is $17, but you can often find it on sale. No matter which design you choose, have some fun selecting colors and fabrics for your costume. This is where the creativity really comes in, and you can have a lot of fun embellishing any design with your own signature touches. That way, you can be sure no one else will have a costume exactly like yours.